Today was a particularly special day. I got to lift the first of my root vegetables! How cool is that. It’s the most brilliant feeling in the world when all the hard work you put in at the beginning of the season pays you back ten-fold, with the most wonderful fresh summer vegetables, which seem to reach perfection at this time of the year. And the best part is, it’s all just a short walk from the back door. I feel this year is going to be a bumper year in the vegetable garden, especially with the return of the rain over the last 2 weeks, everything is looking lush. 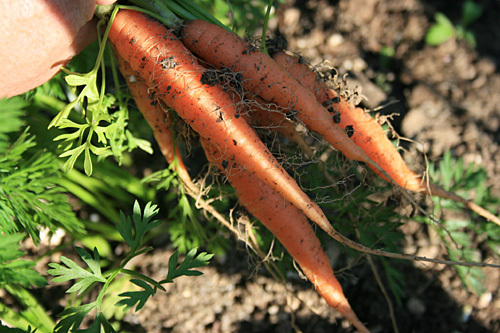 First of the root crops I like to lift are my favourite’s the early Nantes carrots. I sowed these back in late April, which I admit was a bit late, but I never worry as they always seem to catch up in the end. I’ve been lucky with the carrot fly, which may be due in part to companion planting alongside the onions. I read somewhere it does work, so I thought I’d give it a try. I also try and sow thinly to avoid too much thinning out, which can allow the carrot fly in. I like to pull my carrots when they are small and sweet. Pick them young, and this way they only need a wash under the tap, the tops twisting off, and they’re ready to cook. I think the secret to cooking great carrots is to resist boiling them into submission. Instead try roasting them in the oven with a splash of vegetable oil, plenty of salt and pepper, and a couple of garlic cloves mixed with a small onion cut into quarters.